Our junior team were on the receiving end of a very bad beaten on Sunday morning and can have no complaints as they were beaten by a point a man. With twenty five minutes on the clock Ballycommon were ahead 1-7 to no score and it took a great left footed point from veteran Sean Og Farrell point in twenty ninth minute to spare Edenderry the embarrassment of not scoring in the first half. 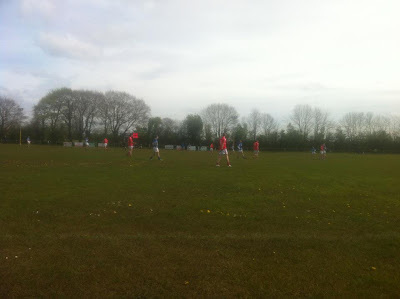 Ballycommon added another point straight from the kickout to leave the reds trailing by ten points at half time. The second wasn't a whole lot better for the reds with Ballycommon scoring 1-4 in the opening fifteen minutes before a Jamie Dolan free gave the reds just their second point in forty five minutes of football. One minute later Edenderry grabbed a goal when a shot from John Gorman was turned in by Jame Dolan. Ballycommon responded instantly with 1-1 of their own and late points from Jamie Dolan and Dan Ryan rounded off a truly miserable day at the office for Edenderry. This was a very bad beaten for Edenderry and it could have been worse. Most of Ballycommon's scores came from the reds giving away the ball or not been able to complete passes. On the day Edenderry were best served by stand in goalkeeper Adrian 'Willie' Bryans who pulled off numerous good saves.